The convenience of mobile wallets is being put to the test, not just with increased competition in the space, but also due to the National Payments Corporation of India’s unified payment initiative (UPI), which is expected to create the next level of growth owing to a more seamless backend. In response to market pressures, m-wallets are expanding their scale of operations and tying up with offline merchants to move beyond recharge-related services, DTH and bill payments. From the likes of Big Bazaars to neighbourhood mom-and-pop stores, petrol pumps, auto rickshaws and milk-booths, mobile wallets are not leaving any offline retail format unexplored. Clearly, the recruitment of offline merchants is critical to the viability of payment solutions, since most consumer transactions still happen offline. “Payment providers that want to win the game will need to focus on usages that are frequent,” says Devangshu Dutta, chief executive, Third Eyesight, a retail consultancy. This is exactly what Paytm is doing with focus on small but frequent transactions. Paytm wallets can be used at petrol pumps, education (school and college fees), restaurants, Mother Dairy and large-format retailers such as Spencer’s and More. “The payment business runs on scale. There is a small margin. So the attempt is to create an ecosystem where consumers use wallet for frequent transactions, though small in amount,” says Shankar Nath, senior vice-president, Paytm. Out of three million daily transaction on Paytm, it claims 40% are coming from offline. Paytm currently has four lakh offline merchants using its platform, including mom-and-pop shops. To facilitate payments through wallets at PoS terminals and online payment gateways, mobile wallet player Freecharge has partnered with payment aggregators like ePaisa and CCAvenue. It has also forged partnerships with retailers like Shoppers Stop, McDonald’s and Café Coffee Day. It claims to have crossed a million transactions in February, with a growth rate of 15-20% per month. Similar is the case of MobiKwik, whose wallet is currently accepted at 25,000 retail outlets, which includes Big Bazaar and Central Mall. “Since last July, the biggest focus area has been on offline merchants. The next big use case is unorganised grocery stores,” says Akash Gupta, GM, marketing, Mobikwik. Even as wallet players are tying up with big format retail stores, experts say a bulk of the big market for wallet resides at the mid-to-low end retailers. “Even in China, one-third of wallet transactions are remittances, a third is peer to peer and the remaining one third is commerce. We expect the Indian market to follow a similar lead,” says Pramod Saxena, founder and chairman, Oxigen Services. 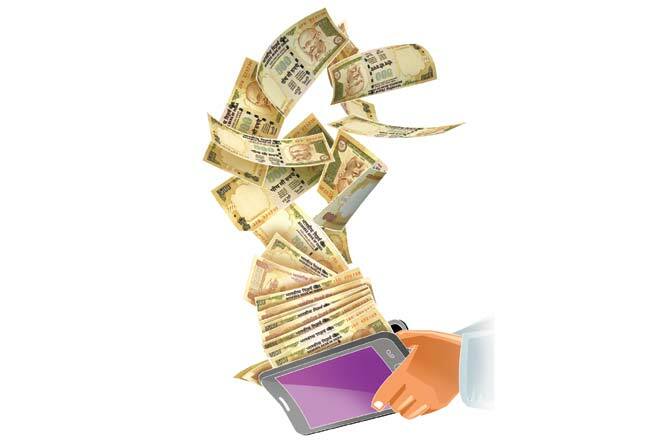 The volume of transactions through mobile wallets stood at 255 million in FY15. The value of transactions carried out through mobile wallets has grown by 500% between 2014-2016. “In value terms, however, mobile wallets contribute just 0.1% to the consumer payments market. Average transaction size still remains low,” says Kalpesh Mehta, partner, Deloitte.